A picture building scheme is a batch of functions to build up a structure picture. And a design scheme is its pendant referring to the picture's design and viewing properties -- somewhat like a style sheet in a word processing application for example. 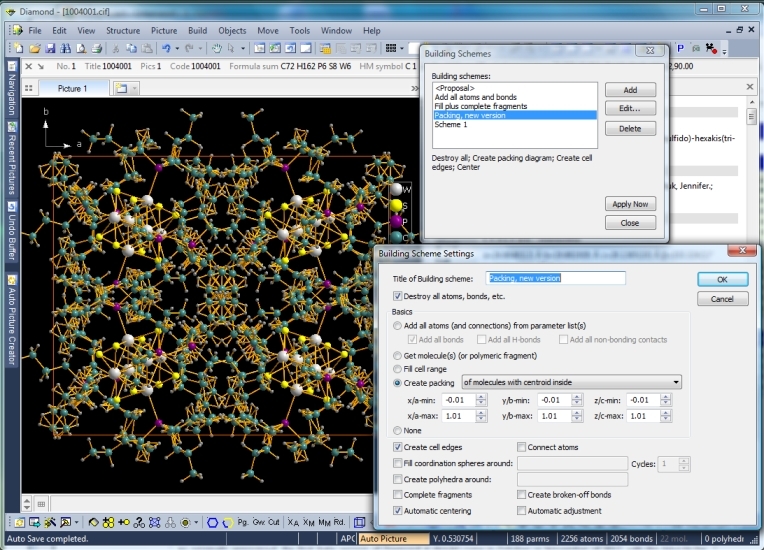 This article shows the application of building and design schemes to series of structure files, which significantly speeds up processing of crystal structures compared to the use of the manual functions from the "Build" and other menus. Actually, the "picture building" is not really new -- it is what you know as "Auto-Build" from Diamond 3. I changed to the "scheme" and removed the "Auto" to emphasize it is a series (or batch) of commands that can be applied to different kinds of structures leading to -- principally -- the same kind of structure picture. 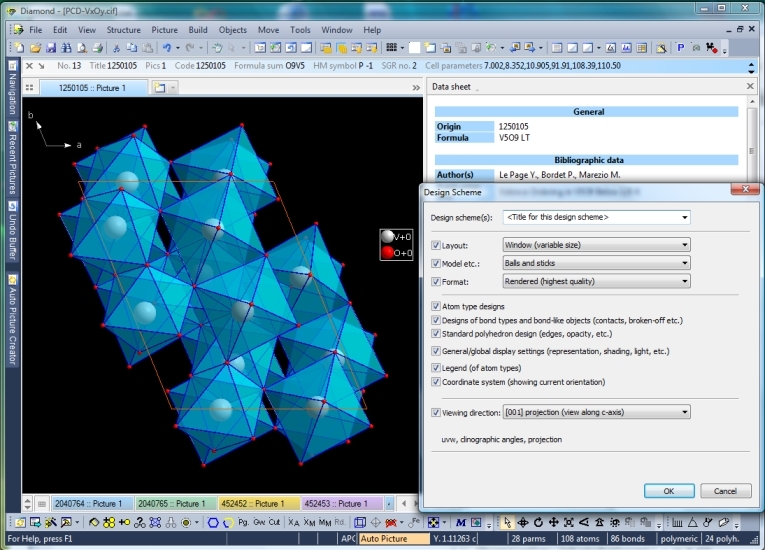 For instance filling a cell range from x=y=z=-1.5 to x=y=z=+1.5 and connecting all atoms (basing on automatically generated and optimized connectivity). The "Auto" is now reserved for the "Auto Picture Creator" (see related article) to emphasize that changes in the "Auto Picture Creator" docking window automatically -- default, this can be switched off -- reflect changes in the structure picture. (1) "Add all atoms and bonds": You can also add the contact and H-bond definitions (and the connected atoms as well) from the connection parameters (cf. new command "Structure" -> "Connection Parameters...") -- that is usually imported from the CIF "_geom_xxx" loops. (3) You can define more than just one cycle for the creation of coordination spheres around atoms of the elements given in the input field right beneath "Fill coordination spheres". You find the design schemes in the corresponding submenu of the "Picture" menu. The first command "Create Design Scheme..." initializes a design scheme from the current picture settings -- from layout, model, rendering or not, across the atom, bond etc. designs up to the viewing direction. Use the checkboxes to decide what the new design scheme may change when applied later. For instance, you can create a design scheme that only reflects the atom (type) designs. So you can easily change current atoms' designs to have different colors, ellipsoid styles, etc. A design scheme can also be selected in the "Picture design" section of the "Auto Picture Creator" -- giving you more detailed control over the design options than just layout, model, and format (rendered, flat, black-on-white). (1) Create a picture building from a pre-defined scheme when opening a (e.g. CIF) file, that means automatically create a structure picture by applying a batch of certain building commands -- optionally along with a design scheme. (2) Using pre-defined settings for "Auto Picture Creator".